This is a new release from the mysterious group/person/artist/ensemble/aliens who like to refer to themselves as The FLK. You might remember they entertained us last year (or was it the year before) with their "We Know Where The Time Goes" LP which consisted of one thirty five minute track full of beats and clips of old folk songs. It worked rather well and left us... well me anyway wanting more. ...and here it is. You can't actually buy this anymore because it's already being deleted. 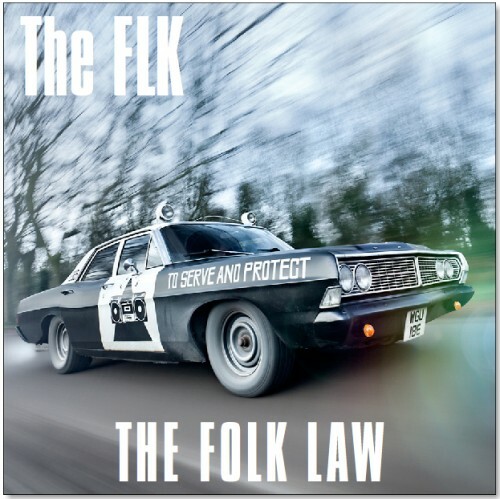 It's an EP entitled "The Folk Law" and has The KLF's old motor emblazoned across it's sleeve which will no doubt add to the rumours that it is actually The KLF behind The FLK. Could be I suppose but I doubt it. The EP was released at the start of September and deleted twenty three days later. There were two hundred and thirty copies pressed and individually numbered on 12" vinyl. Presumably all of these have now being sold and neither love nor money will get you a copy. Whether or not this will be the last we'll hear from The FLK only time will tell but these four new tracks will keep us going for the time being.